The National Center for Creative Aging (NCCA) recently published an article titled “Your Brain On Music, As Explained by Mickey Hart,” which details Mickey Hart’s discovery of the true power of music. Mickey was caring for his grandmother, who had been diagnosed with Alzheimer’s disease and had not spoken in over a year. In an effort to re-spark their relationship, Mickey began to play a song on his drum that his grandmother knew. As soon as he played the song, his grandmother spoke again, saying Mickey’s name. This noteworthy milestone is reinforced by studies about how music may support brain health. 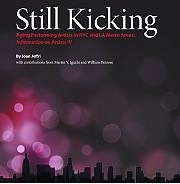 For an interesting read, check out the NCCA website and download “Still Kicking: Aging Performing Arts in NYC and LA Metro Areas,” by Joan Jeffri and the Research Center for Arts and Culture. The NCCA provides a range of white papers, webinars, guidebooks, toolkits and research about the relationship between creativity and aging.